I know it is a bit of a random place to start pregnancy updates, but up until this week I have simply felt too sick to look at a computer screen for any length of time. I thought better late than never? This week has been the most positive week I've had for the last three months and it's made me feel so much happier. Don't get me wrong, I'm still being sick but the 24/7 sickness is beginning to subside and not all food is completely repulsive anymore. In fact I think I may be having my first pregnancy craving...roast potatoes! It's the perfect time of year, as we're all about to be surrounded by roast potatoes on Christmas Day. 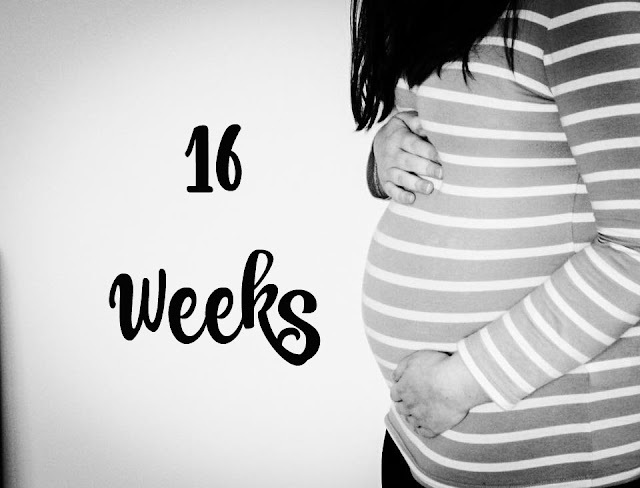 I am convinced I felt the baby move last week and have continued to do so, but I also know that 15 weeks is extremely early which is making me doubt myself. Has anyone else felt their second baby move so early? It is so exciting to think that he or she is wriggling around in there, but it does come with a certain level of pressure. It's now up to me to monitor those movements and act if they become reduced etc. We ended up in hospital when I was pregnant with Isabella due to reduced movements, luckily everything was fine but it was a worrying time. As you can see from the photo I'm starting to get a small bump now, which I'm loving. No need to breath in, wear loose clothing and feel self conscious. As soon as I get a bump my body confidence rockets and all of the bodycon clothes come out. Anyone else like that? I had my 16 week midwife appointment this week, my bloods came back all ok and my blood pressure was good. The appointments are certainly a lot more brief second time around and my next appointment isn't until March. Whenever I walk for any distance I have been struggling with nerve pain in my back and down my left leg. I mentioned it to the midwife and she recommended sitting on a chair backwards to realign in the pelvis, wiggling my hips around in circles and pointing my toes inwards/outwards. Hopefully these little tricks help because on a couple of occasions I've barely been able to walk. Overall I've felt so much more like myself and positive this week. I've been able to play properly with Isabella, start baking for her again and even made my husband a candle lit dinner one night this week! Ahhh first movements are so exciting. I could have sworn I felt the first flutters at 14 weeks but as he was my first I doubted myself.